Earlier this month in Austin, Texas, the largest Ferrari Challenge in North America was made up of sixty-four 488 Challenge and 458 Challenge EVO racing Ferrari vehicles. Held at the Circuit of the Americas on March 10th and 11th, the Ferrari Challenge was the main event of the Ferrari Racing Days event held at the venue. In total, over 100 Ferrari vehicles were on display over the weekend. Weather played a large role in the COTA, as driving conditions were very different between Race-1 and Race-2. For Race-1 on Saturday, the weather was sunny and hot which made concentration difficult for drivers, while Sunday’s Race-2 took place during windy, cooler temperatures, which were much appreciated after the previous day’s heat. 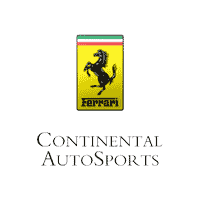 Our own Dealer Principal Joel Weinberger took part in Round 2 of the Trofeo Pirelli race, representing Continental AutoSports with a strong 5th place finish in his #6 Ferrari 488 Challenge, styled in red and black, earning him 12 points this season. The course is a total of 5.500 meters and features a difficult series of 20 twists and turns for an engaging and exciting racing experience. You can see the course and a video recap of the event below!